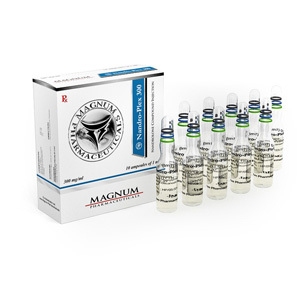 Magnum Nandro-Plex 300 is an anabolic and androgenic steroid. Available in njectable form. Nandrolone phenylpropionate is less popular than decanoate, its ester chain is twice as short. In principle, the fundamental differences between these two pharmacological agents, with the exception of the time it takes for the hormone to be split off into the blood, are practically not observed. Probably the biggest difference is the lower ability of the phenylpropionate to accumulate fluid, which means greater compatibility with androgens. The steroid is fairly safe (due to the shorter period of action), the frequency of side effects is low, and is quickly eliminated when discontinuing the drug. Nandrolone Decanoate (Deka, Retabolil) is structurally different from testosterone, it is the absence of a carbon atom in the 19th position (hence the name 19-nortestosterone) and this makes it more progestin-like. However, because of this interaction with progesterone receptors, the drug entails a number of side effects, which we will talk about later. One of the main differences is that testosterone in the body is gradually converted by the enzyme 5-alpha reductase into a powerful androgen – dihydrotestosterone, due to which most of the side effects are formed. Nandrolone, on the contrary, is converted by 5-alpha reductase into an extremely weak androgen – dihydronandrolone, which has virtually no effect on the body and does not cause side effects. However, this may be one of the reasons for a decrease in libido during the course (due to a drop in blood androgen level).